The rate of a chemical reaction can be measured either by how quickly reactants are used up or how quickly the products are formed. Marble chips, calcium carbonate (CaCO3) react with hydrochloric acid (HCl) to produce carbon dioxide gas. Calcium chloride solution is also formed. Using the apparatus shown the change in mass of carbon dioxide can be measure with time. As the marble chips react with the acid, carbon dioxide is given off. The purpose of the cotton wool is to allow carbon dioxide to escape, but to stop any acid from spraying out. The experiment is repeated using the exact same quantities of everything but using larger chips. The reaction with the larger chips happens faster. Both sets of results are plotted on the same graph. The experiment is again repeated using the exact same quantities of everything but this time with half the concentration of acid. The marble chips must however be in excess. The reaction with the half the concentration of acid happens slower and produces half the amount of carbon dioxide. The experiment is once again repeated using the exact same quantities of everything but this time at a higher temperature. The reaction with the higher temperature happens faster. Hydrogen peroxide naturally decomposes slowly producing water and oxygen gas. 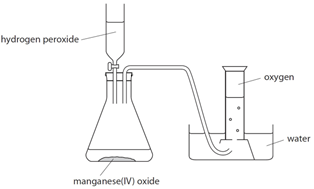 Manganese (IV) oxide can be used as a catalyst to speed up the rate of reaction. The rate of reaction can be measured by measuring the volume of oxygen produced at regular intervals using a gas syringe. Sodium thiosulfate (Na2S2O3) and hydrochloric acid (HCl) are both colourless solutions. They react to form a yellow precipitate of sulfur. 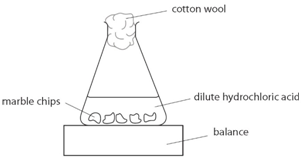 To investigate the effects of changes in concentration of sodium thiosulfate on the rate of a reaction, the conical flask is placed above a cross. 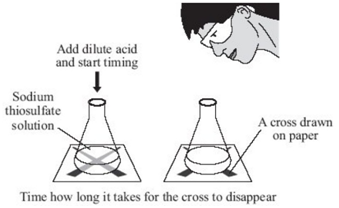 The reaction mixture is observed from directly above and the time for a cross to disappear is measured. The cross disappears because a precipitate of sulfur is formed. In order to change the concentration of sodium thiosulfate, the volumes of sodium thiosulfate and water are varied (see results table). However the total volume of solution must always be kept the same as to ensure that the depth of the solution remains constant. In this reaction, sulfur dioxide gas (SO2), which is poisonous is produced therefore the experiment must be carried out in a well ventilated room. The results are recorded in the table below and then plotted onto a graph. 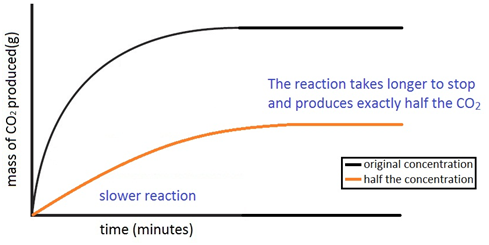 The graph shows that the rate of reaction is directly proportional to the concentration. The experiment can also be repeated to show how temperature affects the rate of reaction. 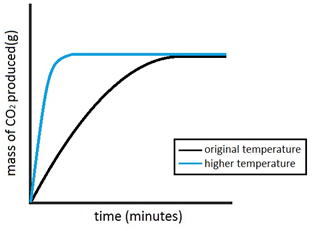 In this experiment the concentration of sodium thiosulfate is kept constant but heated to range of different temperatures. 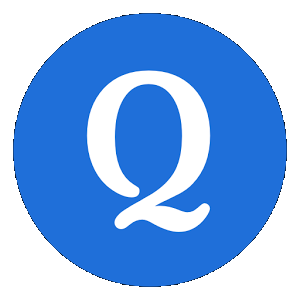 As a rough approximation, the rate of reaction doubles for every 10oC temperature rise. Increasing the surface area of a solid increases the rate of a reaction. 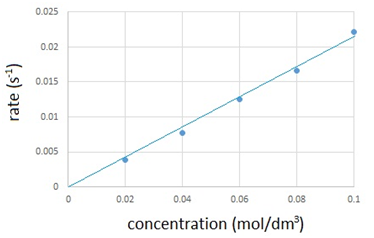 Increasing the concentration of a solution increases the rate of a reaction. Increasing the pressure of a gas increases the rate of a reaction. Increasing the temperature increases the rate of a reaction. 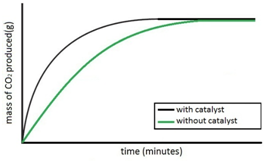 Using a catalyst increases the rate of a reaction. A catalyst is a substance that increases the rate of a reaction, but is chemically unchanged at the end of the reaction. Catalyst: A substance that speeds up a chemical reaction without being used up. A catalyst speeds up a reaction by providing an alternative pathway with lower activation energy. 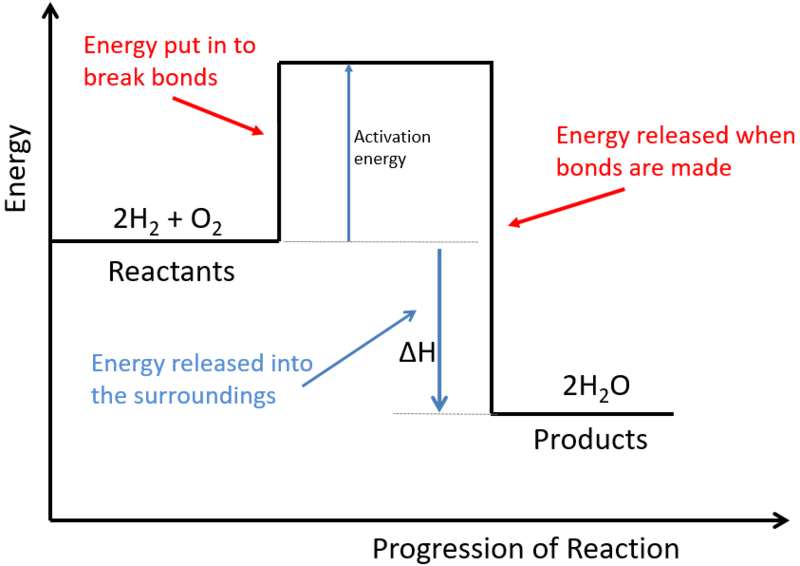 The activation energy is the minimum amount of energy required to start the reaction. For an exothermic reaction, the products have less energy than the reactants. The difference between these energy levels is ΔH. For an exothermic reaction, more energy is released when bonds are formed than taken in when bonds are broken. For an endothermic reaction, the products have more energy than the reactants. The difference between these energy levels is ΔH. 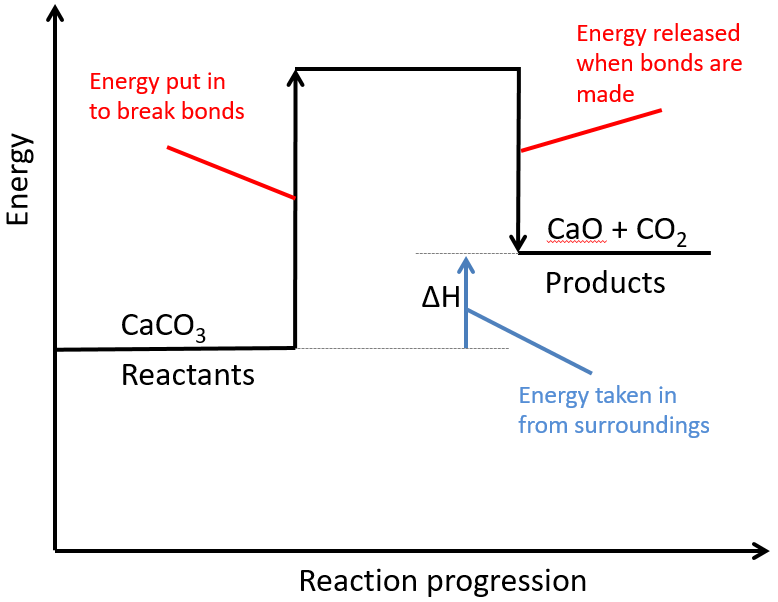 For an endothermic reaction, more energy is taken in to break bonds than is released when new bonds are formed. 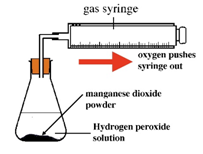 Oxygen (O2) is made in the lab from hydrogen peroxide (H2O2) using manganese(IV) oxide (MnO2) as a catalyst.